It was a friend’s birthday weekend. We booked time off work, postponed the completion of our papers, and road-tripped to Quebec’s biggest city, Montreal. Amazingly, I had never been. By the end of the trip, all I wanted was to prolong our stay for just a few more days (perhaps years), but we had obligations to get back to. So, when I read this article in The Toronto Star, I was curious: apparently, Montreal has a secret hidden behind its glass. Being a city full of artists and a certain je ne sais pas, I was not shocked to read that glasswork is a big deal there. As the article points out, there are schools dedicated to the medium (Espace Verre). Right now glass appreciation year is happening, and the city is holding a celebration called “Montréal, Ville de Verre” — City of Glass — with over 100 events. However, as Carol Perehudoff points out, glass as art is not the only window to Montreal’s soul. 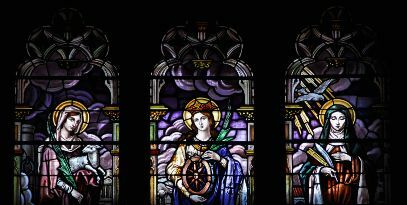 Apparently, in two different churches, stained-glass windows have been uncovered. The mystery is why they were covered up, or bricked over, in the first place? Sleuths, bust out the magnifying glasses. Anyways, Ville de Verre has activities running all year long, and now that it’s summer it should be added to the itinerary. Winters are mighty cold.